It wasn’t my typical Thursday morning when I was whisked away into Santa’s Magical World for the preview of the Holidays At Union Station. We had so much fun last year attending Polar Express, but I can tell you from what I saw, Holidays at Union Station is so much bigger and better! You can tell the amount of planning, thoughtful design and attention to detail in every inch of this event. While you can still ride the train like last year, there is so much more to do than just a train ride. The inside of Union Station has been magically transformed into a Winter Wonderland. Where stores used to be, there are original and creative stories being told in each area. From Candy Cane Mini Golf to Photos with Santa, there is so much to do with every inch of the space. Outside in Glacier Park, there will be ice skating, tubing (yes tubing!) and a Fire and Water Show. The elves were working away on these areas when we got to visit, but it looks like it will be so much fun! First up, the Santa’s Express. Ride with Santa November 18-20, 23, 25-27, 30; December 1-4, 7-11, 14-24, 26-30. The train times are 4:45pm / 6:15pm / 7:30pm / 8:30pm. 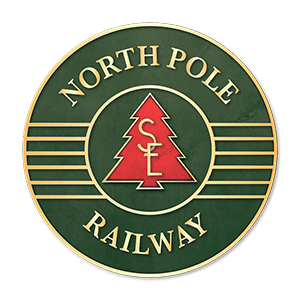 For the standard Santa Express ticket it includes the ticket, access to North Pole Village, hot chocolate and a Christmas cookie. Meet and greet with Santa Claus with photos! The biggest change is the North Pole Village. There is so much to do! The cost to visit North Pole Village is $5 unless you have a train ticket, that is included. When you’re done inside, head outside to Glacier Park! I’m really excited about this area! There is seriously so much to do in one day. Don’t forget you can book a hotel stay for an even more fun adventure with your family. There are lots of fun events including Milk & Cookies with Mrs. Claus or even a Reindeer Rise ‘n Shine Breakfast. I know Hattie would love to meet a Reindeer, that may have to be on our list of things to do! So there you have it. A quick overview of the event. It’s going to be one of those magical e events your kids will take about for years to come! Trains start running on November 18th! Oh my gosh I would have been in Heaven!! Give me all the Christmas with a side of Santa! Oh how I wish we would have something like this close to us! How fun!